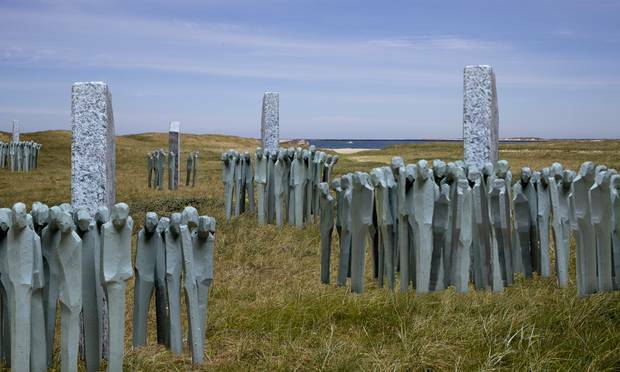 A memorial park commemorating the Battle of Jutland will open in Thyborøn on the west coast of Jutland on the occasion of the 100th anniversary of the largest naval battle of the First World War, reports Jyllands-Posten. On June 1, an international ceremony will take place dedicated to the British and German soldiers who died in the battle that lasted from 31 May to 1 June 1916. Twenty-five granite stones shaped as ship bows and a total of 8,645 statues will be erected in the park to represent the ships and seamen who perished in the battle. The park spreads across the dunes along the North Sea near Thyborøn about 100 km away from the location where the naval battle took place. Grandsons of the British and German admirals who fought in the Battle of Jutland will participate in the unveiling ceremony. The Battle of Jutland was the only full-scale naval battle of the First World War. More than 240 battleships were involved in the clash between the British and German naval forces, of which 25 fell victim to a massive exchange of fire. In the summer of 2015, the Sea War Museum opened in Thyborøn, displaying hundreds of original maritime warfare objects.